Arvato Systems to Demonstrate Award-Winning Media Solutions and Technology at HPA Tech Retreat | Arvato Systems | IT Strategy. Solutions. Innovation. arvato Systems will present its award-winning solutions and technology for media companies and broadcasters at the 2016 HPA Tech Retreat February 15-19, 2016 in Indian Wells, California. New York, US, February 1, 2016	(Newswire.com) - arvato Systems will join the Hollywood Professional Alliance as an exhibitor at this year’s HPA Tech Retreat and will showcase the advanced technology that has garnered the company several awards at recent events. At the show (February 15-19) , arvato Systems will focus on its solutions for Media Asset Management, Collaborative Editing and Studio Production. The VPMS Enterprise-class MAM system is ideally suited for technologically and functionally complex environments. As complexity increases, media organizations struggle to achieve not only operational efficiency, but also to maintain the strategic position necessary to meet rapidly changing conditions and demands. The VPMS solution, technology and underlying platform ensures that operators have a professional and elegant web-based user interface and that management can automate and monitor complicated processes while the open architecture and easy to integrate technology provides a strategic path for growth and change. arvato Systems will also be showcasing EditMate, the innovative and award-winning suite of tools for collaborative editing and project management which turns Adobe Premiere Pro CC into a Production Asset Management system (PAM). 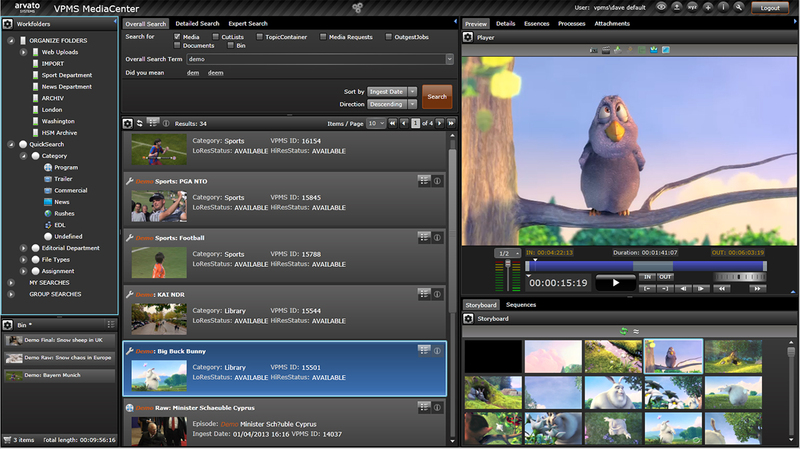 Also available will be the ClipJOCKEY studio production tool, which controls video servers and VTRs to deliver endless possibilities for production and playout workflows. To learn more, find arvato Systems at the HPA Tech Retreat or online at www.s4m.arvato-systems.com. The image shows VPMS, arvato Systems’ flagship Media Asset Management solution that will be one of the systems presented at HPA. As a global next generation IT systems integrator arvato Systems focuses on "Digital Transformation Solutions". We use the technology talent and expertise of over 3,000 people at more than 25 sites throughout the world. Being a part of the arvato network and Bertelsmann, we have the unique capability to create entire value chains. Our teams create integrated, future-proof business infrastructures that help make our customers more agile and competitive, and enable them to deliver new standards of service to their customers. We create streamlined digital processes that support innovative business models. Moreover we provide operation and support services. Customers from the world of media, one of our core areas of expertise, also benefit from these solutions. Custom-tailored arvato Systems solutions for broadcast management, media asset management, and publishing, enhanced by marketing and enterprise solutions are in use today in more than 30 countries. The HPA Tech Retreat is an informal gathering, in the Palm Springs area, of the top industry engineering, technical, and creative talent, as well as strategic business leaders focused on technology, from all aspects of digital cinema, post production, film, television, video, broadcast and related technology areas, for the exchange of information. The 2016 HPA Tech Retreat will take place February 15 to 19, in Indian Wells, California. The HPA serves the professional community of businesses and individuals who provide expertise, support, tools and the infrastructure for the creation and finishing of motion pictures, television, commercials, digital media and other dynamic media content. Through their partnership with the Society of Motion Picture and Television Engineers® (SMPTE®), a leader in the advancement of the art, science and craft of the image, sound, and metadata ecosystem, the HPA continues to extend its support of the community it represents. Information about the HPA is available at www.hpaonline.com.